300 Watts of Powerful Heating Comfort. 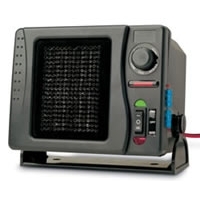 The 12 Volt Direct Wired Ceramic Heater / Fan with Swivel Base. Change From Heat to Cool settings with the flip of a switch. This heater/Fan is perfect for heating small vehicles or areas in the winter and does a great job of blowing air in the summer time. Includes the easy mount swivel base and ring terminals come pre-crimped and soldered onto the power wires. Other mounting hardware is also included. Takes the chill off the truck cab in the morning without a problem. The installation was pretty simple. I've never wired anything into a vehicle before and this was actually pretty easy. A bit warmer and very thankful, Trent H.